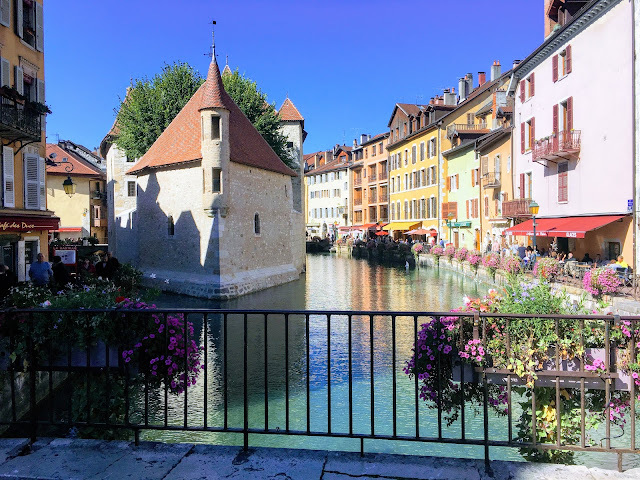 Annecy, France - "The Venice of France" | Logic & Laughter Logic & Laughter: Annecy, France - "The Venice of France"
Annecy, France - "The Venice of France"
This is probably our second favorite place to take visitors after Gruyere. When we have family and friends in town there is a list of "must-see" places near our home and Annecy is always a favorite. Sometimes referred to as the "Venice of France", Annecy has a river and a couple small channels running right through it's center. The area surrounding the canals is car free which is nice for children to roam around. The children enjoy climbing on the short rock walls, splashing in the fountains, walking over the numerous bridges, smelling and admiring the bountiful containers of flowers and playing in 1 of the many playgrounds. There are several specialty stores, including my favorite spice shop which I visit almost every time we go to Annecy. There are also several clothing stores, some boutique and some bigger brands and an innumerable amount of restaurants and cafés. Several of the restaurants line the river that runs through the town all offering outdoor dining. While visiting with friends who were not able to walk as far, we decided on a boat tour of the lake. The tour was interesting and Lucas enjoyed being on the water, but it wasn't my favorite thing to do in Annecy and after about 30 minutes of it even he was ready to just walk around on the boat. It is a nice way to sit down and rest for a bit so if you are wanting a break and a (quasy) tour at the same time then I would do it. Otherwise, I would recommend just finding a bakery item to-go and a park bench to enjoy it while people watching. Something we haven't tried yet is renting a paddle boat to take out onto the lake. I think the children would enjoy packing a picnic and a swimsuit and paddling ourselves out onto the lake on a hot day. Perhaps this Summer we could plan a trip to Annecy just for a swim in the lake while jumping off or sliding off a paddle boat rental. More photos of Annecy Click Here.